Seattle's annual Pride parade got an extra boost from the recent DOMA decision. "It was wonderful to be a part of and to know that we are living in an area that is so supportive of equal rights for everyone," says Sarah, writing on the blog Sarah and Ryan In Seattle. The transplanted Canadians managed to get more than a few shots of the annual Pride parade, which enjoyed an extra boost thanks to the recent DOMA decision. "It's really a big deal," said one parade attendee to the Seattle Times. "We're happy to be on the right side of history." So, by the look of Sarah and Ryan's snaps, was a certain Halo character, with a Warthog in all the colors of the rainbow. The Warthog also got a Twitter shout-out from 343 Industries, currently in charge of the franchise. 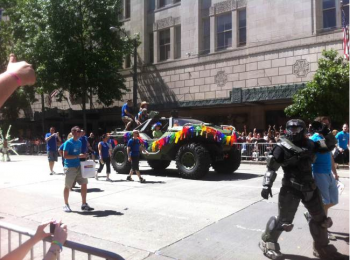 "We were honored to celebrate Seattle's Pride Parade this weekend with a special appearance from the Halo Warthog," said a 343 representative, "and thank the community and parade organizers for letting us contribute to the festivities." The parade, which marched 12 blocks, had a wide range of floats and entries on display. Judging by the Seattle Times' photo gallery, marriage was a popular theme this year.